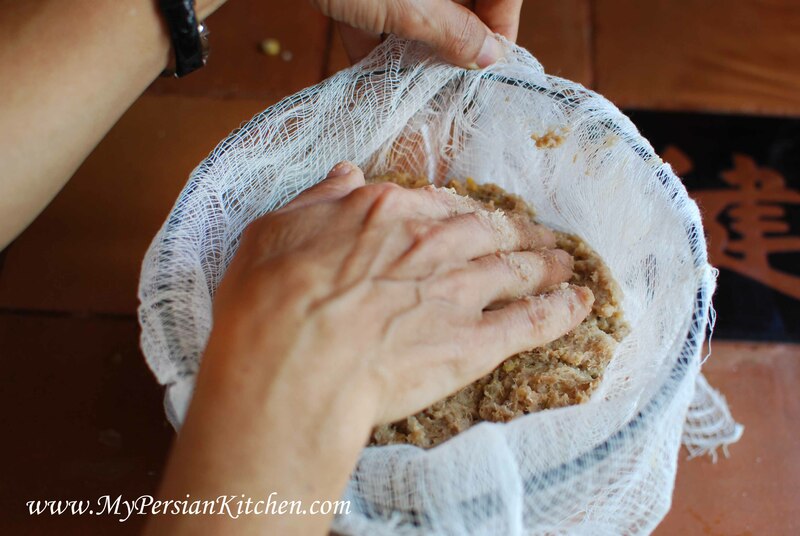 Last year one of my mom’s cousins, Nilou, told me that she was going to send me a few of her mother’s recipes for me to post on MPK. A few months back my cousin Cyrus came to the US from Switzerland for visit. 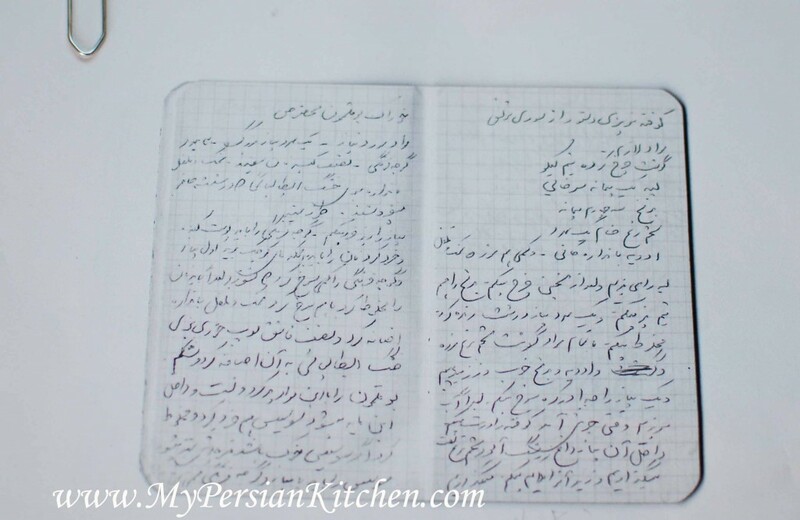 He brought along an envelop from his mother and inside of it were copies of his grandmother’s recipes. So here I was with a few new family recipes written in Farsi and unable to read them because my Farsi is not good enough to read calligraphy. Since my mom is here now, I have taken the opportunity to have her read them for me. 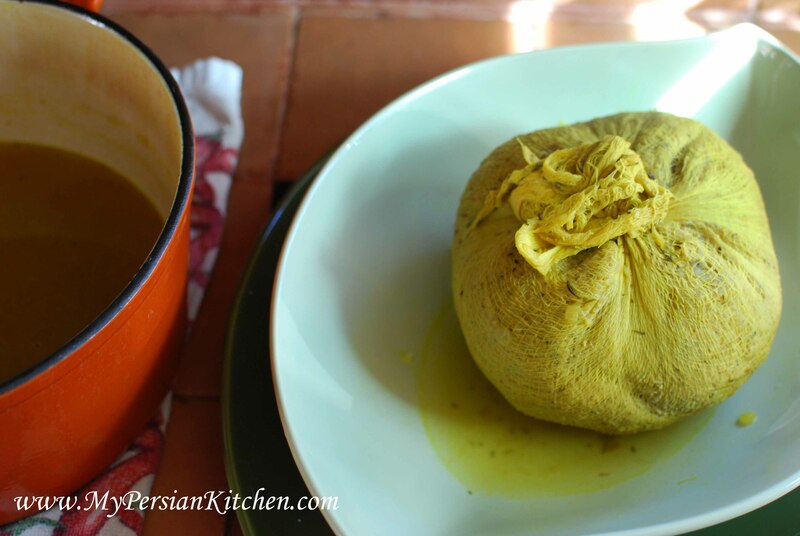 I figured since I have thus far published a good few of my grandmother’s recipes it was time to publish one of Nosrat Joon’s recipes. 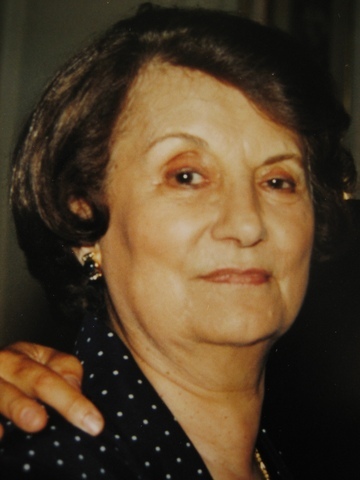 Nosrat joon sadly passed away about 6 years ago. I last saw her maybe a year of two before she passed while she was here visiting her son who around MPK is known as Hungry Tiger. For those of you who regularly read my blog, Hungry Tiger is married to the infamous Neda! 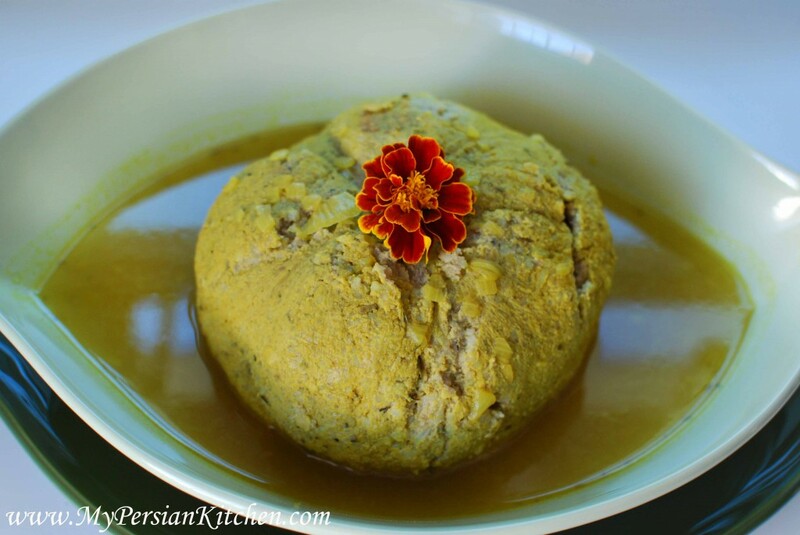 Today’s post is Nosrat joon’s version of Koofteh Sabzi, a large stuffed meatball from Tabriz. Cook split peas until tender. Cook rice until just tender. Grate one of the two onions and smile dice the other onion. Hard boil one of the eggs. 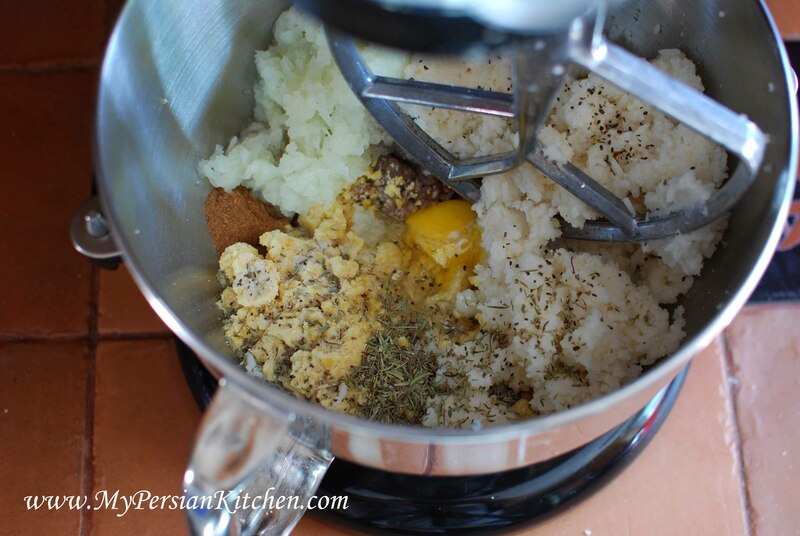 Place cooked split peas in a food processor to mash. The idea is for the split peas to have a dough consistency. Do the same thing with the rice. 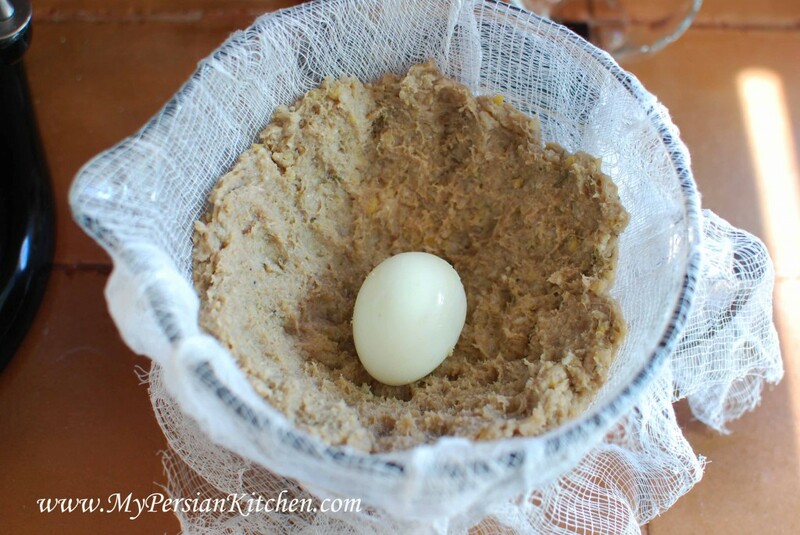 Combine ground beef, rice, split peas, grated onion, advieh, dried summer savory, one raw egg, salt and pepper. Mix well together. 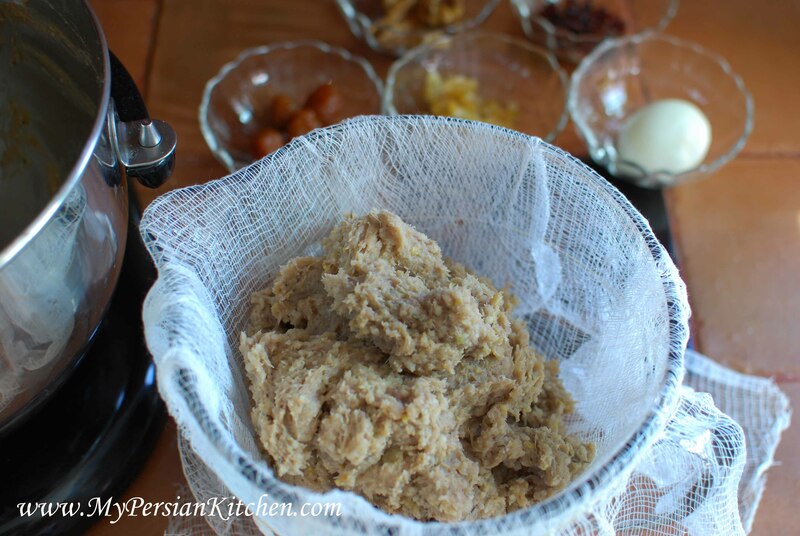 Knead the mixture until it turns into a dough consistency. Make sure that you have seasoned the mixture well with salt. Saute the diced onion in some oil until golden in a large pot. 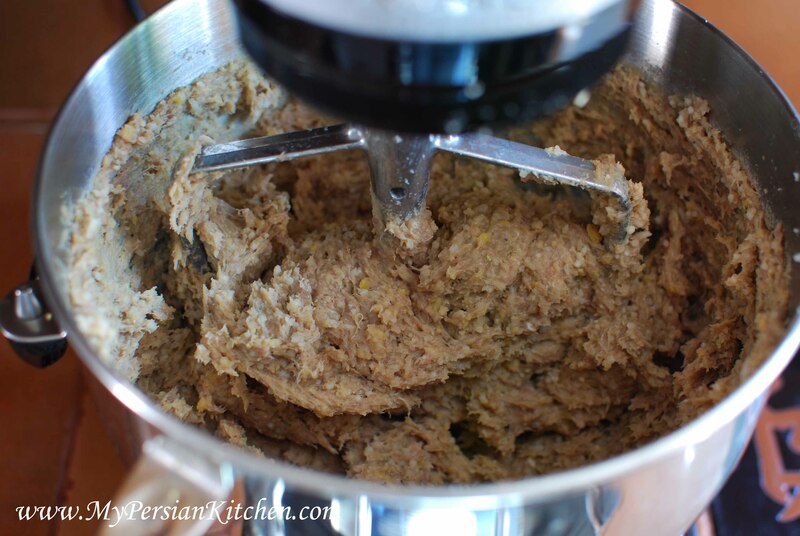 Take 1/2 cup for stuffing the meatball. 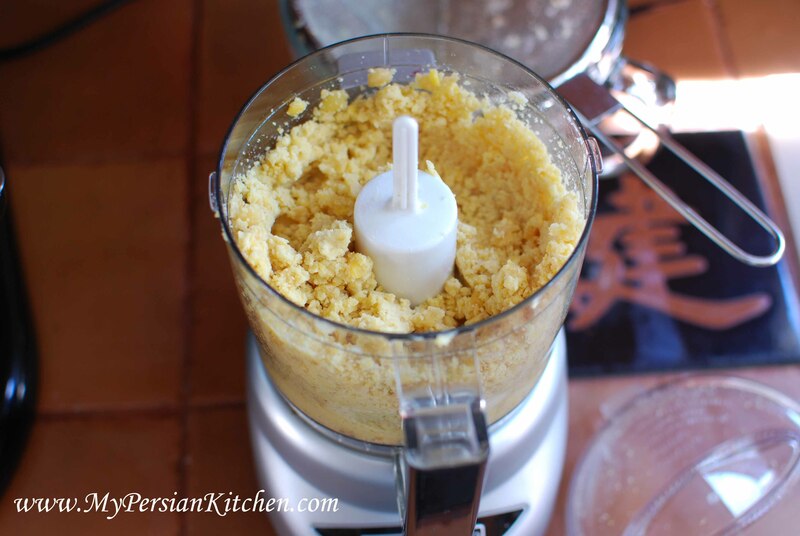 Also quickly saute the zereshk in some oil or butter for a few minutes. Toast walnuts for a few minutes. Then gather all the ingredients along with a bowl lined with a cheese cloth. 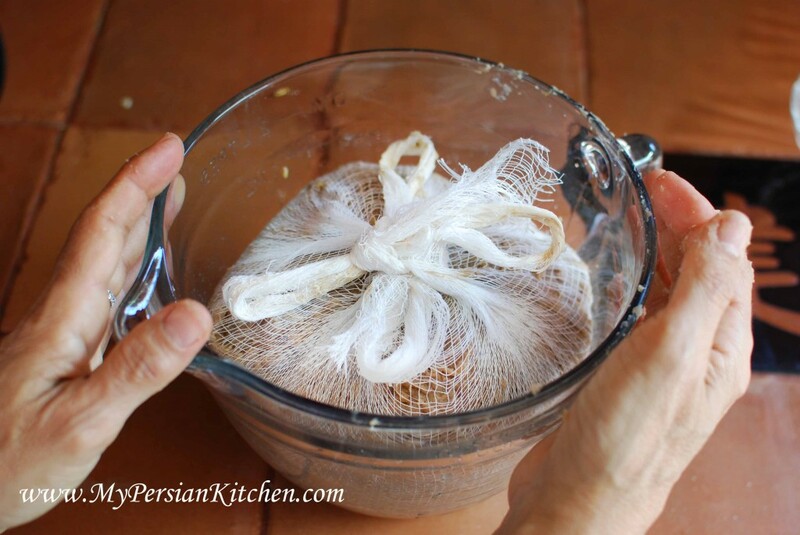 To make it easier on yourself place a rubber band around the edges of the bowl so that it holds the cheese cloth. 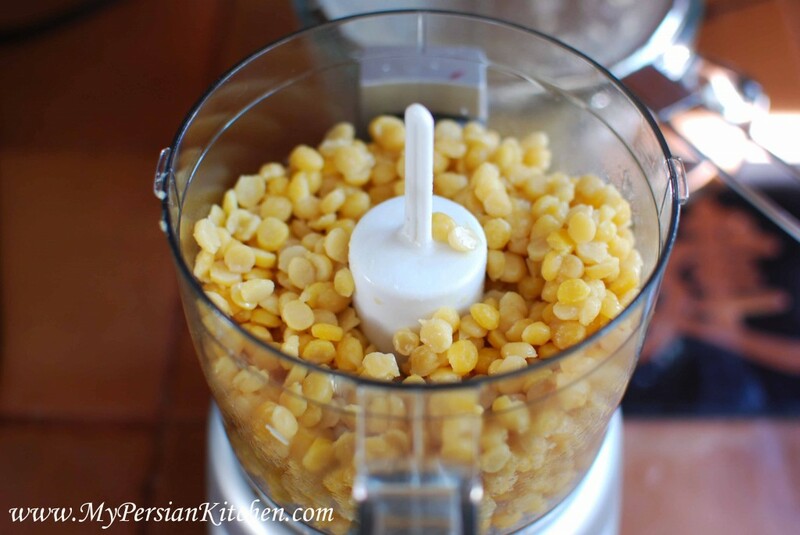 Gently add the majority of the mixture to the bowl leaving behind about one handful of it. 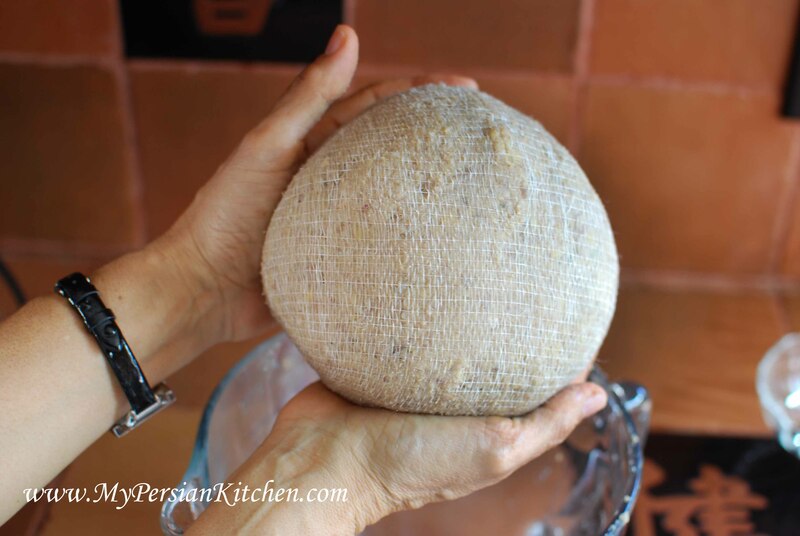 Create a well by pushing the dough towards the wall of the bowl. Place the hardboiled egg in the middle. Add prunes around the egg. You can use any prunes you like. Also, the pits stay in. Just warn those who you are sharing this meal with about the pits!!! 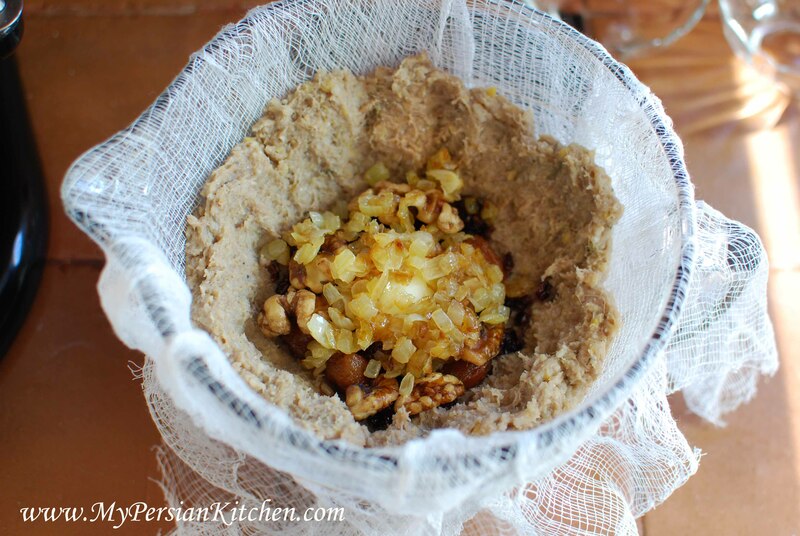 Place remaining dough mixture on top and gently press down to seal. 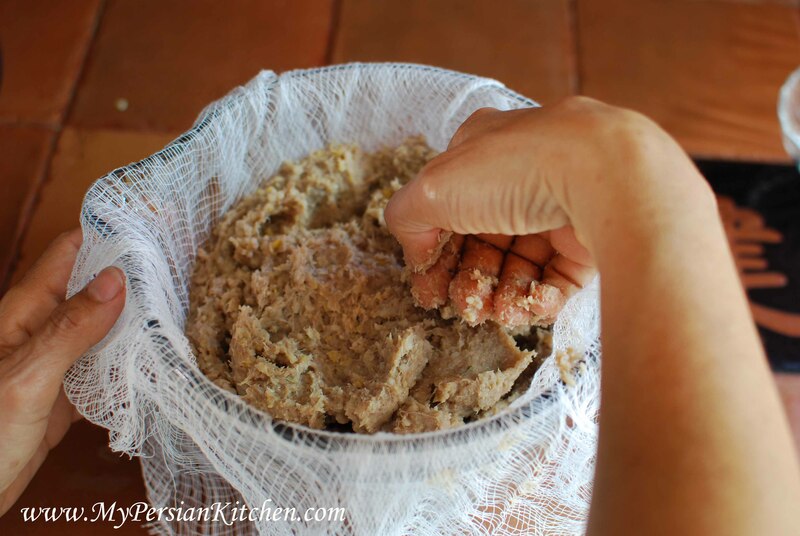 Go around the edges and seal the meatball. Carefully close shut each corner of the cheese cloth. I would suggest making a bow so that way it’s easier to open later. Gently pick up the giant meatball and shape it into a ball. Gently go around and shape it with your hands into a ball. 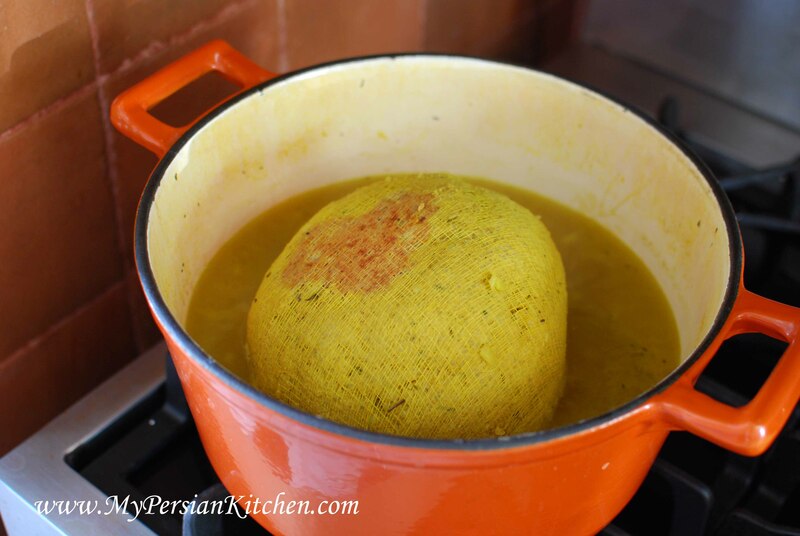 Add some turmeric to the pot where the onions were sauteed along with 10 cups of water. Season with salt and pepper. Bring to a boil and place the meatball into the boiling water. Cook covered for 1 and 1/2 hours. As it cooks pour some of the liquid over it within the first 20 minutes. Half way through the cooking process gently and carefully flip the meatball. Once ready take the meatball out and place it in a deep serving bowl. 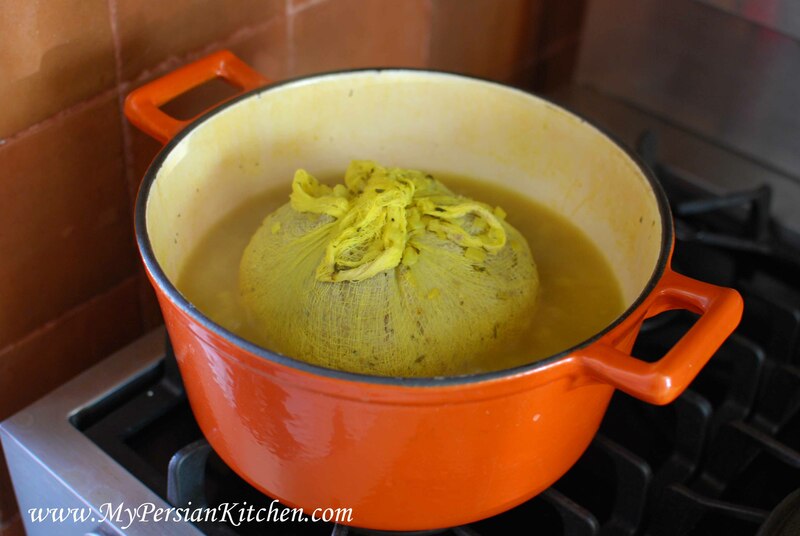 Remove cheese cloth and ladle the sauce over the meatball. 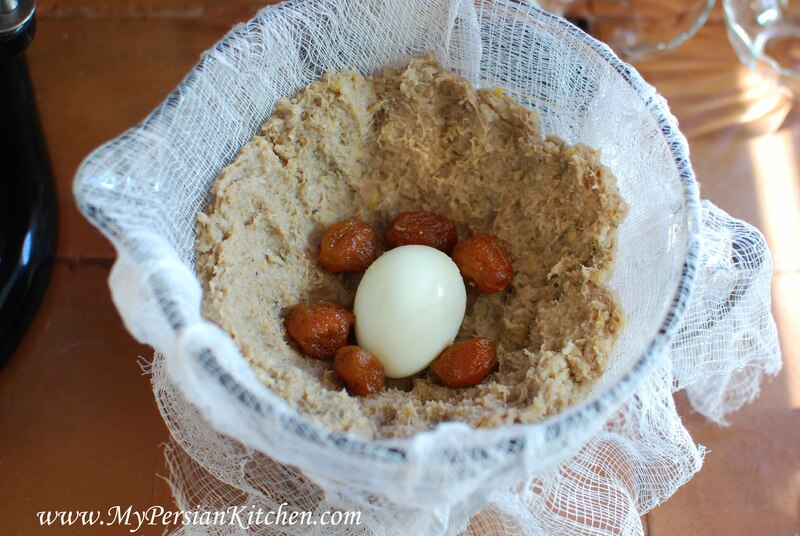 This is what the Koofteh, meatball, looks like once it’s opened. This is such a delicious meal and it’s perfect on a cold day. The delicious smell of the Kofteh takes over the house as it cooks and flirts with your nose!!! It’s definitely a good thing that my mom and I made this recipe together as it made it easier for me to photograph when she was handling raw meat. Weeee that would have been an adventure if I was on my own. 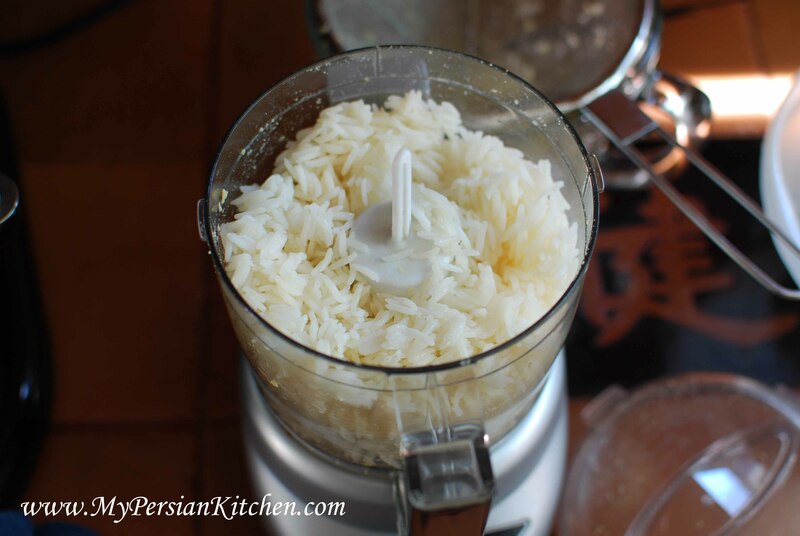 Thank you Nilou joon for sharing Nosrat joons recipes with me. That looks wonderful! I can almost taste it through the computer, heh-heh. But one question: what is “advieh”? Thank you as always for bringing back many memories. 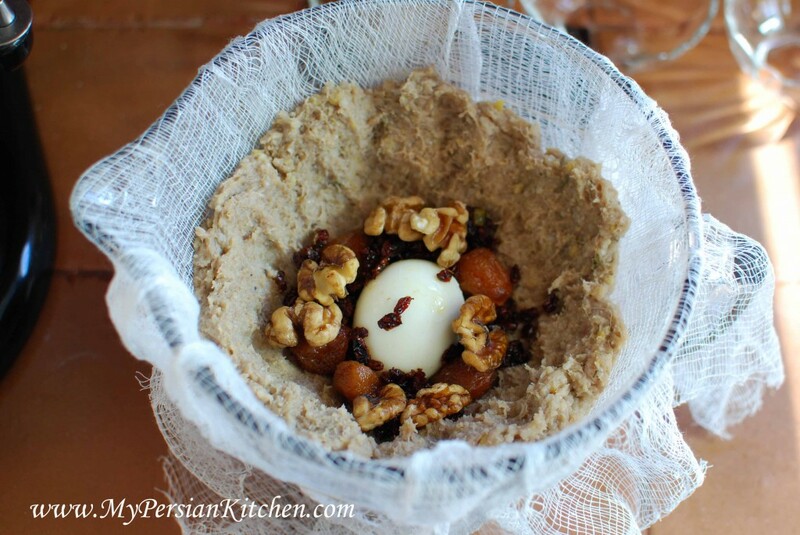 I had this dish many years ago, and I wanted to make it but couldn’t find the recipe for it. Can you tell me what is dried summer savory? is there any Farsi name for it? @ Leilee, a whole chicken??? Oh my!! No I have not had it before. I can just image it being one hell of a challenge to keep it all together! 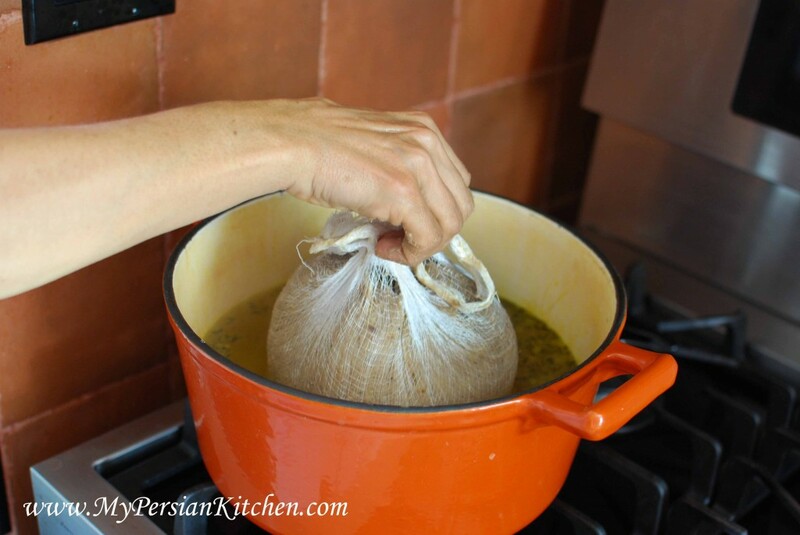 @ Mahnaz, the Persian name for Summer Savory is Marzeh. @ Vajihe, thank you so much for stopping by and your comment!!! Loving this. Coincidentally, I was just reading about this recipe somewhere. Think I saw it on a menu. It looks so fun and festive! @ Bria, it is really good and hearty!! yum yum!! Thank you for your lovely blog.You just made them easy to follow for us with putting these pictures.Brilliant effort.Add more recipes with your story,Please. Elahe, thank you so much for your kind words!!! Glad you enjoy the blog! Made and just enjoyed it. It was wonderful. Thanks for sharing. Adi, so glad you liked it! That’s an interesting technique, never heard of it. 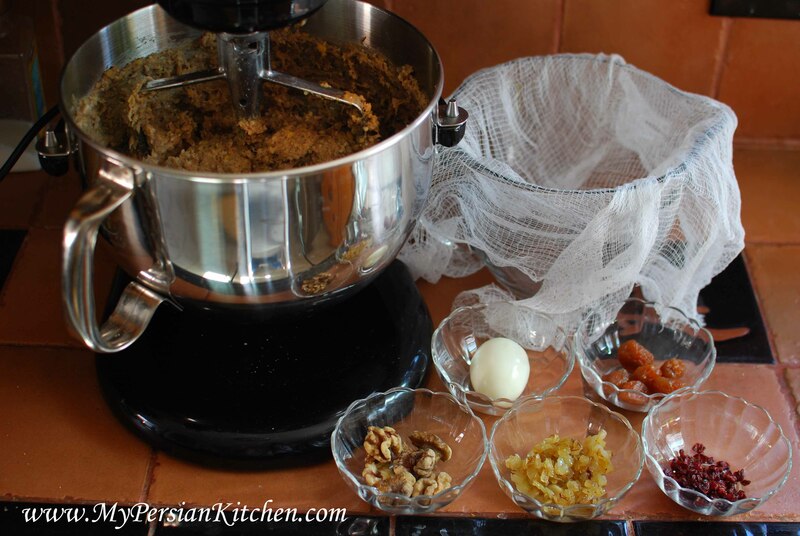 In Iran, we usually don’t grind the meat/rice/chickpeas together. 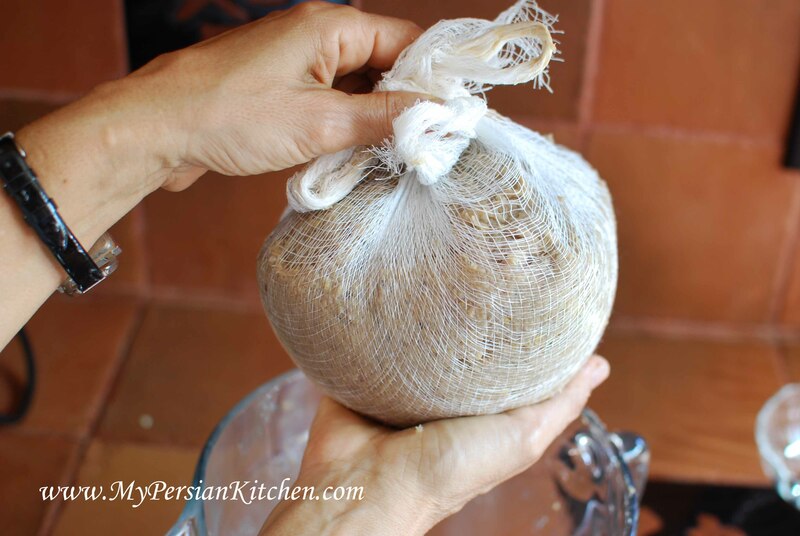 It’s all done by the power of Iranian shoulders, elbows, and wrists and it’s not mashed up so that the kofteh doesn’t have a super smooth outer appearance. 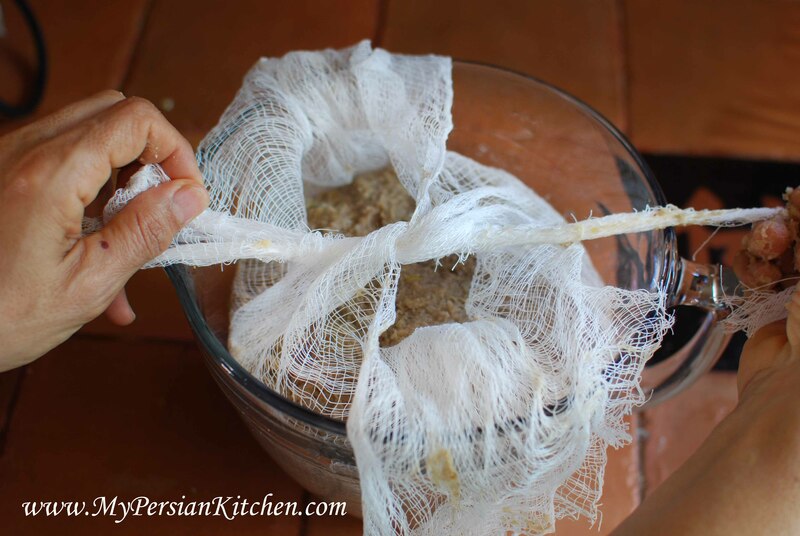 It’s fun to make, but my husband doesn’t like Tabrizi style so I never make that for him. He Loves Koofteh Beerenji which is pretty good too but not as delicious IMO. Nice little challenge for you Mrs Birley. See if you can do it first go. 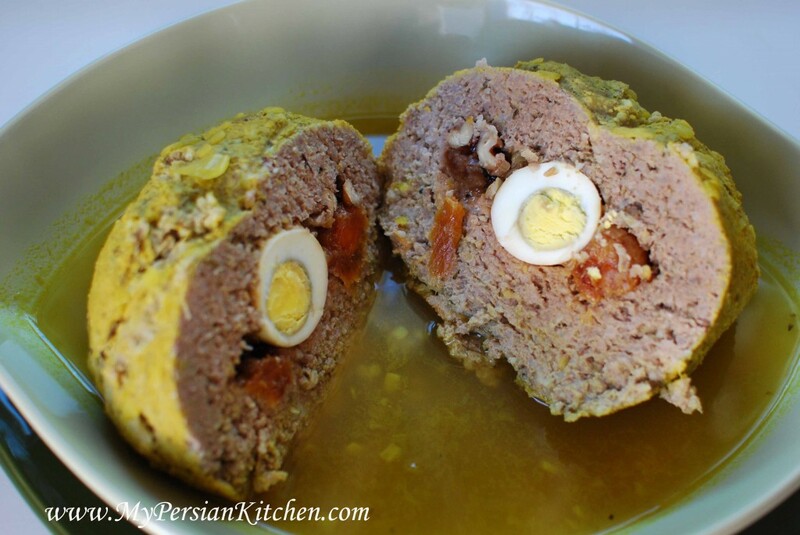 Hi.Tahnk you for your good recipe.I cooked Kofte according to it and ir tasted so delicious .The most important part of such kofte is that that we should be careful about it not to split but mine turned bad and missed its shape. But it tasted good.Thank you so much for those clear pictures too! Advieh is something that make foods delicious like pepper salt but in Iran we have special thing like this that called advieh. So I should hopefully be able to try this ..
Also, mom’s recipe did not blend peas and rice – however I can see the merit in it.. Thank you for awakening the senses back to happier childhood days. pshad, wow, a whole chicken?! 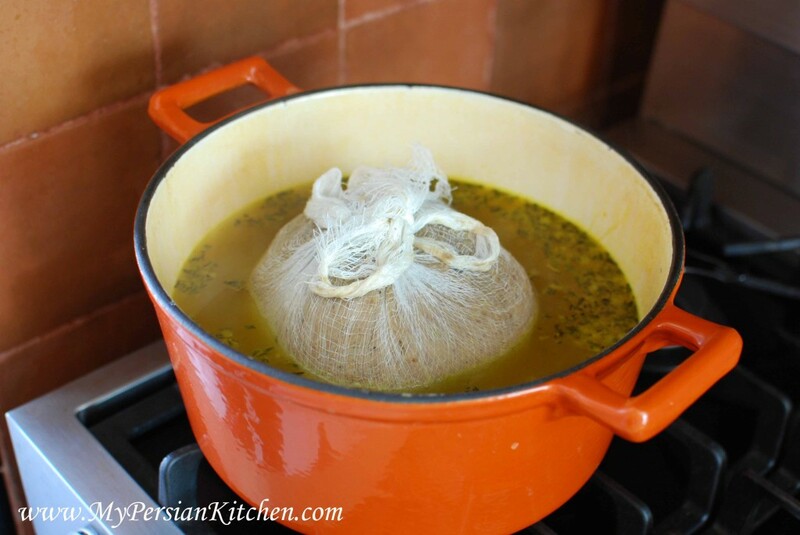 I am always tickled by the different ways in which Iranians make the same dish.